This is one of those posts that just expands as I write it. I originally had an idea in mind to talk about one of my fave R&B songs of 1999, but the majority of my posts in this section tend to be songs that hit #1 on the Hot 100. So I clumped together my three of my favorite R&B tunes from this power year for pop in one post, and it just so happens they all feature a trio of women! The first -- "Heartbreak Hotel" -- is not a cover of the Elvis Presley classic but a laid-back, classic R&B breakdown that just warbles in intensity, featuring three incomparable women of soul: Whitney Houston, Faith Evans and Kelly Price. It is the epitome of late 1990's R&B -- a ballad that still encourages you to sway and bob your head. Although it's truly Whitney's song, Kelly's riffs toward the end are still very memorable -- and it was my first real introduction to what an incredible vocalist she truly is. Not much else needs to be said. Secondly, we have Blaque, or otherwise known outside of the US as Blaque Ivory, that was mentored by TLC's Left Eye, and was projected to be a TLC for the new millenium, launching during TLC's surge of popularity thanks to "No Scrubs" (and they opened for the group during the big comeback tour). 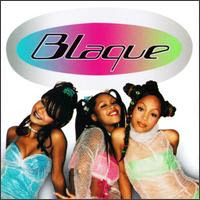 Blaque officially made their mark here in the U.S. with their pop-tingled second single, "Bring It All To Me", featured JC Chasez of *NSYNC showing of his "thug appeal" which always made me scratch my head. The guess was it was a favor to Left Eye, as she had recently provided a rap verse on *NSYNC's "Space Cowboy" off their No Strings Attached album. The song went to #4 on the Hot 100. However, my fave song off that entire album was the album's first single: "808". The video does not allow embedding, so check it out here. If you think their style is reminiscent of the UK's Mis-Teeq, you'd be pretty correct, as Blaque was kind of the US answer (and a more R&B version) to the UK garage group. 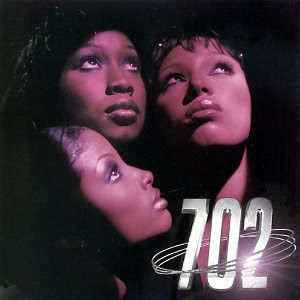 So much so that, they recorded a song called "Can't Get It Back" for their sophomore album in 2002 -- but the album got shelved, and the song was re-recorded by Mis-Teeq themselves. The song was released both in the UK (as their final single) and in the US as their followup (and also final single) to "Scandelous". However, unlike Mis-Teeq, Blaque is still together, and are working on a new album for release this year. And finally - the original reason behind this post: 702. This trio of girls were first noticed by Michael Bivins of Bell Biv Devoe (if "Poison" is not in your iTunes library, it really should be! -- Am I the only one who hears their influence on V Factory? ), and the majority of their sophomore album was produced by Missy Elliot. While their early singles only saw real success on the R&B charts, their breakthrough lead single of the sophomore album, called "Where My Girls At? ", became a staple jam of 1999. Again, embedding is disabled (stupid UMG can be so irritating sometimes), so you can check it out here. The song peaked at #4 on the Hot 100 to become 702's biggest commercial hit, and gained them a Lady of Soul nomination. Personal Note: The first time I heard the song was when I saw the video being replayed over and over while waiting for a plane layover back in 1999. I was actually in Rome, Italy, enroute with my family to Montepescali, Italy, for my cousin's wedding, and it was my only trip to Europe. It was a complete highlight of my life getting to visit Italy, as I am in fact half Italian. This song and Geri Halliwell's debut solo single, "Look At Me", were played so often during that three hour layover, that I almost remember them being the only videos played, although that can't be true. Still -- I loved the song so much upon first listen, I bought the album from a music shop in the Rome airport just before our flight to Montepescali was set to take off. I still have it. It's one of my few keepsakes from that trip as it's packaging was distinctly different than how compact discs were packaged back in the USA. my god how i loved whitney's my love is your love album. like forever and a day. She has a new cd out in September. Finally!